In the following page, you'll see a few Missionaries we support. For more information and our other missionaries, check out this website www.globalpartnersonline.org. If you would like to consider supporting our missionaries, please click the button below to go to the list of missionaries on the Global Partners website. David and Brenda Babcock have ministered for 40 years in Central and Eastern Europe with Operation Mobilization (OM). Since 1992 they have been in a networking relationship with Global Partners. They are serving as Wesleyan missionaries while continuing their long-term ministry with OM. At the beginning of their ministry, Eastern Europe was controlled by communism. David and Brenda had to secretly smuggle Bibles, children’s materials, and teaching books into these countries. Today, they are able to openly work alongside the churches and their people in missions, evangelism, and training. For the last ten years, David and Brenda have had the responsibility to train and provide pastoral care to mission teams within 13 countries. One of their main goals is to help those who have made a good beginning in ministry be able to continue for the long-term. David and Brenda have six grown children (two are adopted), ten grandchildren in Austria, Croatia, and the United States, and one great grandchild in Austria. “. . . we constantly pray for you, that our God may count you worthy of his calling, and that by his power he may fulfill every good purpose of yours and every act prompted by your faith” (2 Thessalonians1:11 NIV). “I felt God leading me into full-time missions work when I was 12 years old at youth camp. The next year, I knew God was calling me to Japan. Through the years, God has confirmed this call in my life through people, Scripture, and experiences. 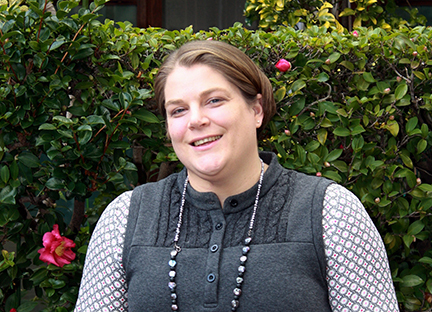 He has given me a passion for missions and for the spiritual growth of Japanese people.” Andrea Swarthout served in Japan for two years as a Global Partners’ intern missionary, and in February 2008 she was appointed to long-term missionary service. In a small town in Iowa, Andrea grew up in a Wesleyan pastor’s family, and she came to know the Lord at a very young age. Experiences throughout her teens helped to solidify her faith and make it personal. She earned a B.S. degree from Bartlesville Wesleyan College (now Oklahoma Wesleyan University) in intercultural ministries and an M.A. in biblical studies from Asbury Theological Seminary. She is an ordained pastor in The Wesleyan Church. Andrea’s passion is to assist the Japanese Church in their vision to become a dynamic influence and a thriving witness for Christ to the culture around them so that God may be honored. Ephesians 3:7-9 represents God’s call on her life: I became a servant of this gospel by the gift of God’s grace given me through the working of his power. Although I am less than the least of all God’s people, this grace was given me: to preach to the Gentiles the unsearchable riches of Christ, and to make plain to everyone the administration of this mystery, which for ages past was kept hidden in God who created all things. Perry and Nancy Hubbard have served in missionary ministry with Global Partners since 1986. They served in Sierra Leone from 1986-1994, in Papua New Guinea from 1995-1999, and in Guyana from 2000-2006. In 2007 they studied Spanish in Costa Rica for eight months before relocating to Panama where they currently live and minister. In 2002 Perry was appointed to serve as the director of the Wesleyan Center for World Missions in Ibero-America and the Caribbean through JIBACAM. Since then, he has traveled throughout the Caribbean and Ibero-America, teaching missions and related topics to church leaders and members. Part of his role includes writing and producing materials that teach and encourage missions involvement. The Hubbards are also involved in assisting The Wesleyan Church of Panama. Perry has developed a Bible institute curriculum for them, which uses a variety of learning methods, including weekly and intensive classes, as well as the online Wesleyan material at www.ibwww.org. He is also involved in the local men’s ministry. Nancy gives leadership to the hospitality ministry of the church, teaches in the children’s ministry, and serves as the director of the Kindness Evangelism team. Perry and Nancy have three grown children: John, Jeff, and Jessica.